It has taken some time, but our full stack NVIDIA GPU ray tracing results are here! 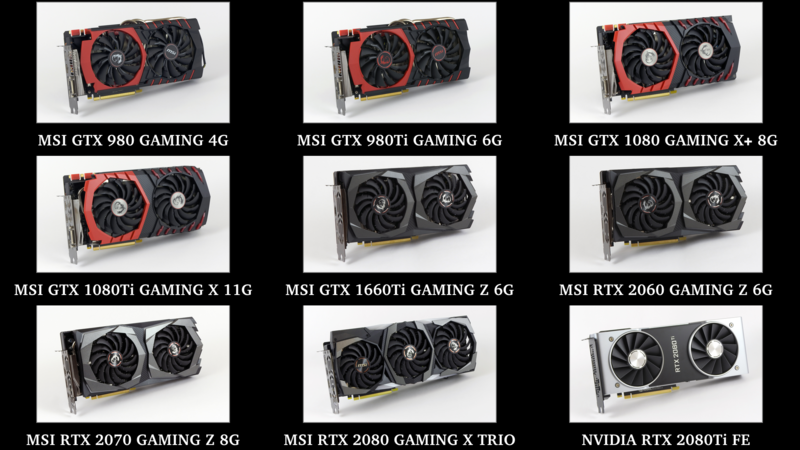 Two Maxwell (GTX 980 Ti, GTX 980), two Pascal (GTX 1080 Ti, GTX 1080) cards are stacked up against our RTX/GTX Turing lineup - featuring 9 GPUs in total. Octane and LuxMark provide neat benchmark tools, results are provided in Million samples per second. Octane additionally provides a score metric where 100 serves as a base score for a reference GTX 980. 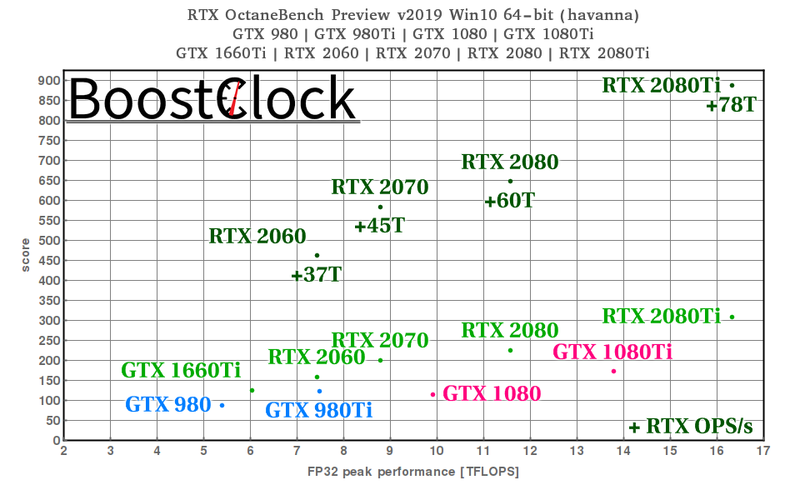 Moreover, OTOY released RTX OctaneBench 2019 Preview as well - a beefed up OctaneBench with experimental support to leverage ray tracing acceleration hardware using the NVIDIA RTX platform. 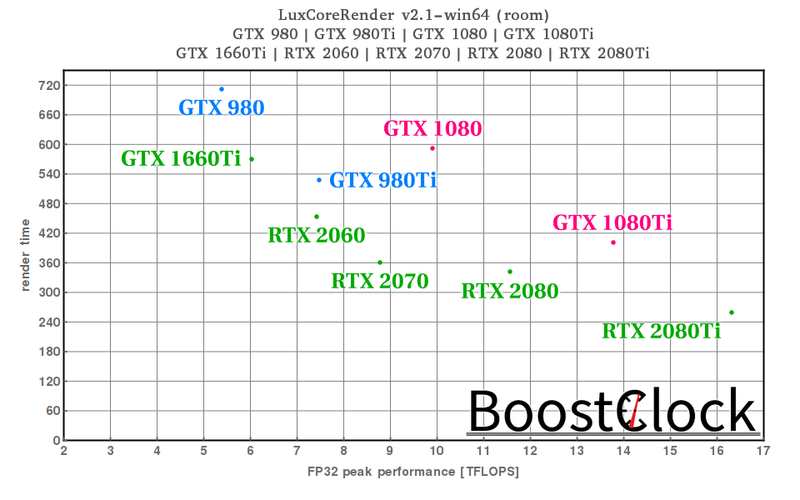 LuxCoreRender is a physically based and unbiased rendering engine. 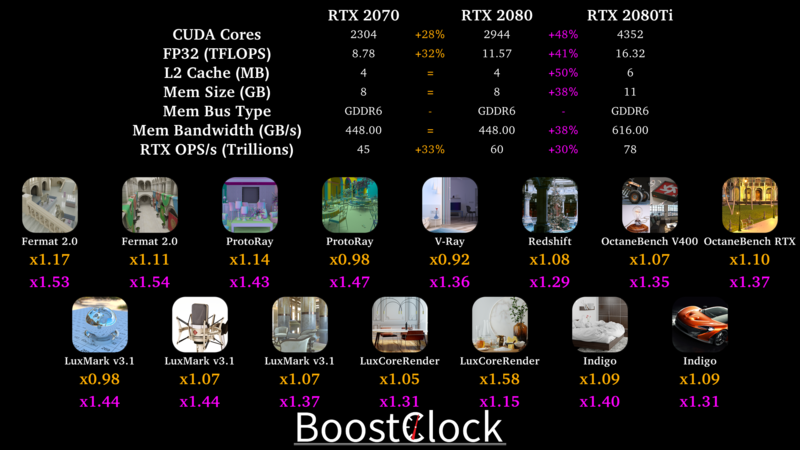 It uses OpenCL to run on any number of CPUs and/or GPUs available. 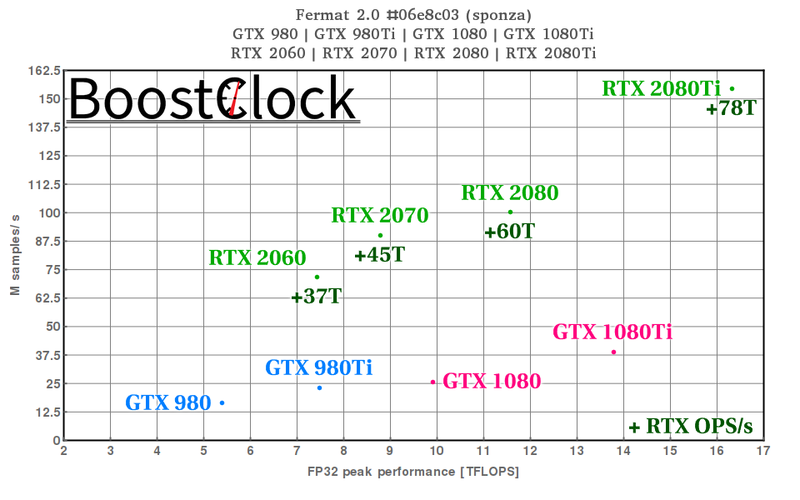 Fermat is a high performance research oriented physically based rendering system - the project uses CUDA and OptiX intersection library to generate photorealistic images and was recently updated to utilze RT Cores in Turing GPUs for ray-triangle intersection and BVH traversal. 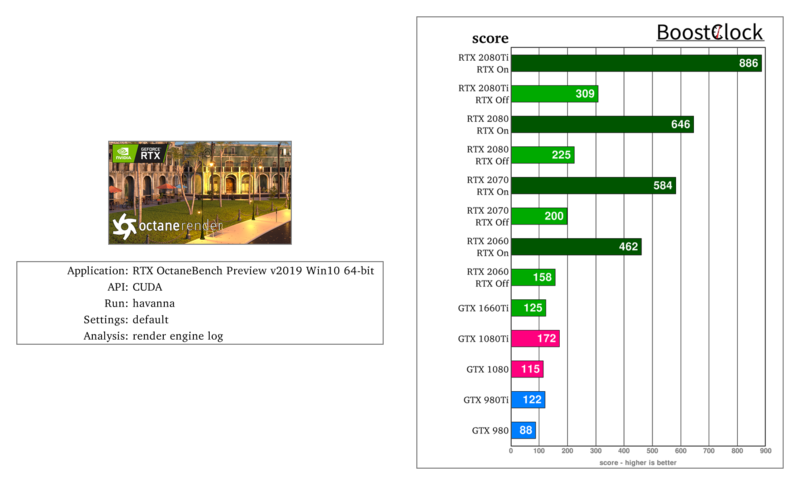 ProtoRay is an open source Embree benchmark suite that can be configured to use OptiX as a backend. 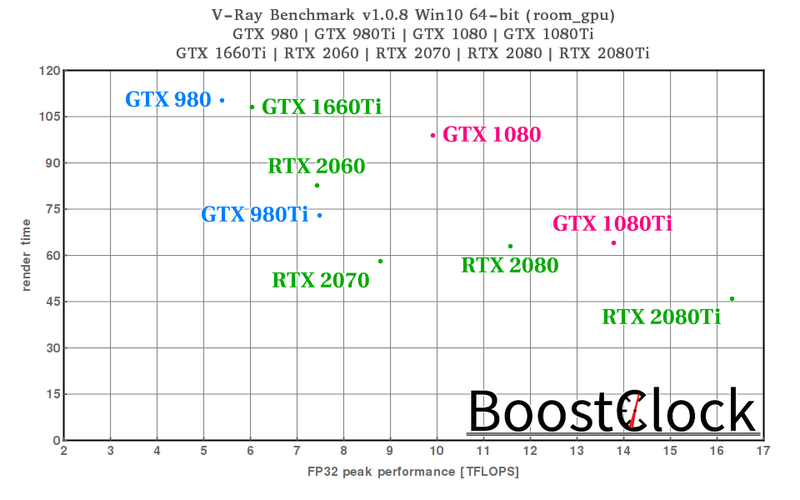 Which GPU to go for? 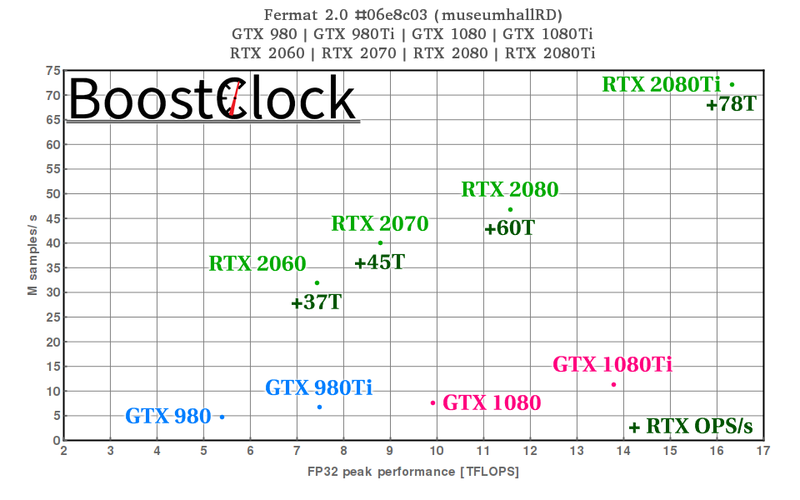 In the two "RTX Ready" applications (OctaneBench RTX, Fermat 2.0) Turing GPUs with RT Cores wipe the floor with the GTX Pascal GPUs - even the GTX 1080 Ti is a no match for the smallest Turing with RT Cores, the RTX 2060. 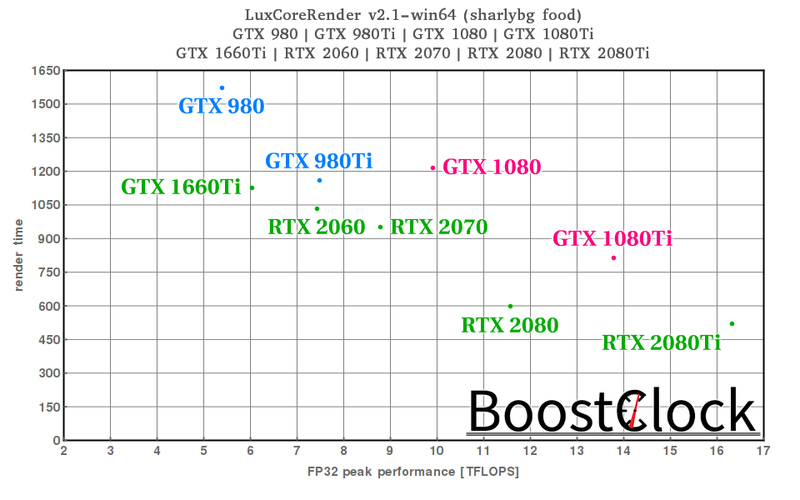 If one can work around the limited amount of VRAM (archviz freelancers), the RTX 2060 and 2070 are great picks. 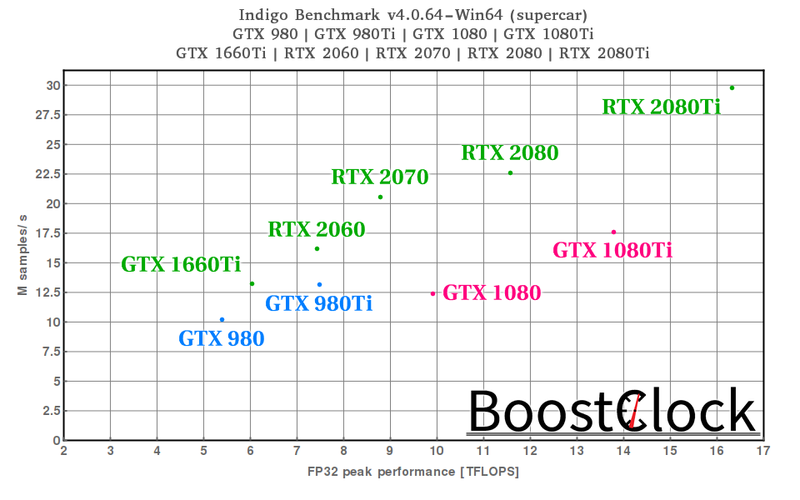 But one have to stress that complex scenes with densely populated geometry and high-res textures easily fill up the available VRAM of these GPUs. 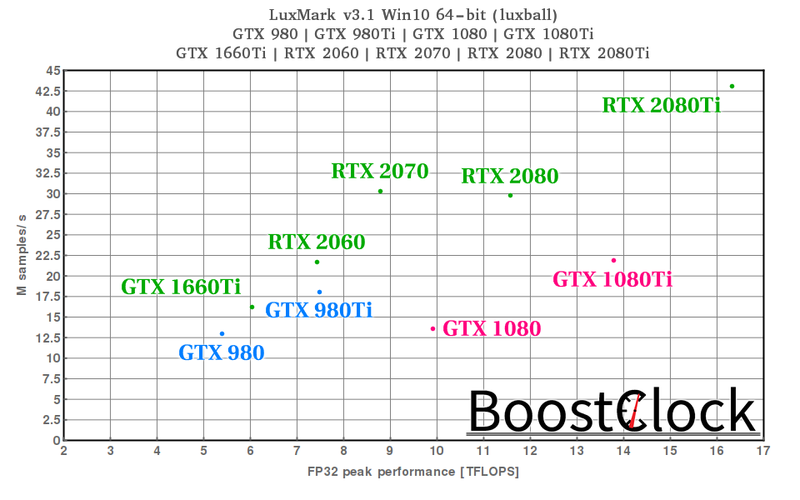 The RTX 2080 is a tough one to recommend - the 28% more CUDA cores doesn't really translate into that much extra performonce over the RTX 2070 and they both wield the same amount of VRAM. 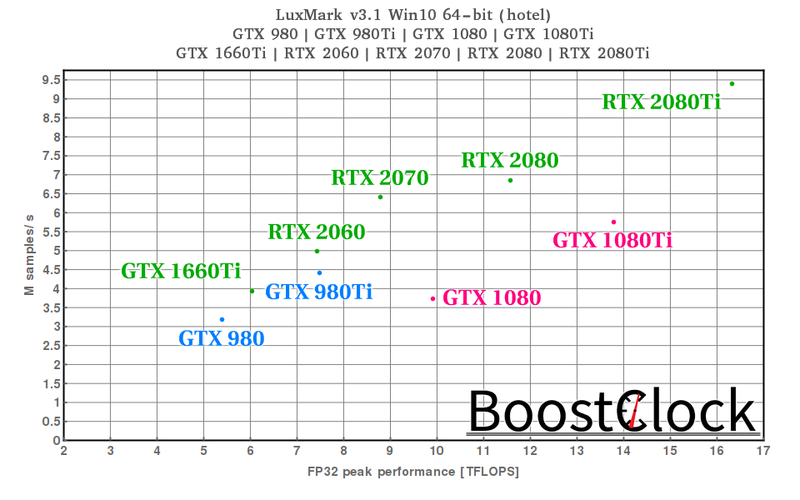 The most powerful Turing, the RTX 2080 Ti tops the charts in every benchmark - no surprise here. 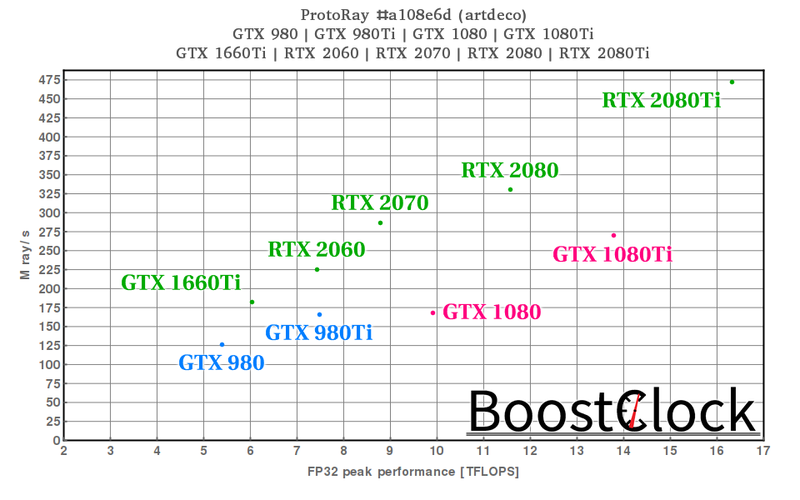 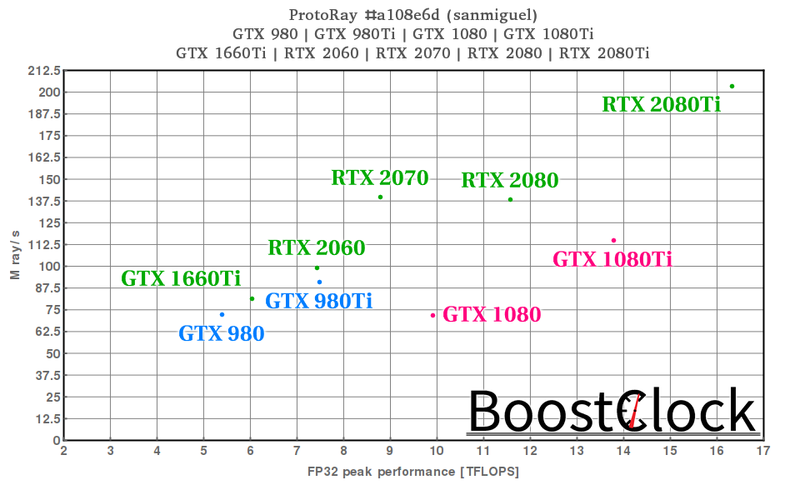 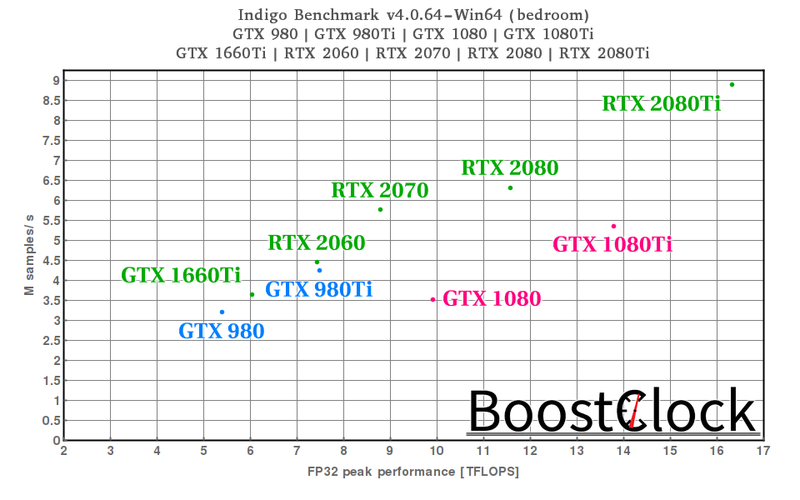 In traditional CUDA core rendering applications it shows nice gains over its predecessor, but the RTX enabled benchmarks where things really go boom with extreme speed-ups over the GTX 1080 Ti. 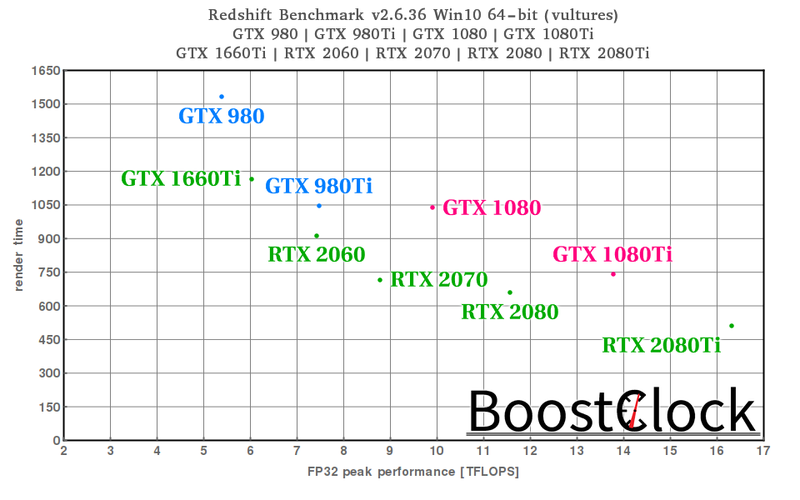 Note 01: Bar chart results are rounded to keep them tidy, meanwhile the percentage values on the black summary tables are computed from raw results with more decimal places.